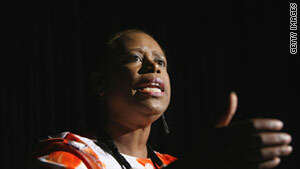 Former Rep. Cynthia McKinney: "It's important that people all over the world see the truth." McKinney says she was invited by the "nongovernmental organization for fact-finding"
McKinney: "Last thing we need to do is spend money on death, destruction and war"
McKinney: "I think that it's very important that people understand what is happening here"
(CNN) -- A former U.S. congresswoman slammed U.S. policy on Libyan state TV late Saturday and stressed the "last thing we need to do is spend money on death, destruction and war." NATO warplanes have been pounding military targets since March after the U.N. Security Council approved a resolution to protect civilians by any means necessary, as Gadhafi's forces try to quash a nearly three-month revolt against the leader's roughly 42 years of rule. "I want to say categorically and very clearly that these policies of war ... are not what the people of the United States stand for, and it's not what African-Americans stand for," she told state TV. "Under the economic policies of the Obama administration, those who have the least are losing the most. And those who have the most are getting even more," she said. "The situation in the United States is becoming more dire for average ordinary Americans, and the last thing we need to do is to spend money on death, destruction and war."